Wintershall is continuing its growth on the Norwegian Continental Shelf. In the Awards for Predefined Areas (APA) 2016 licensing round, Germany’s largest internationally active oil and gas company received shares in five licenses by the Norwegian Ministry of Petroleum and Energy. The company will be operator of two of these. 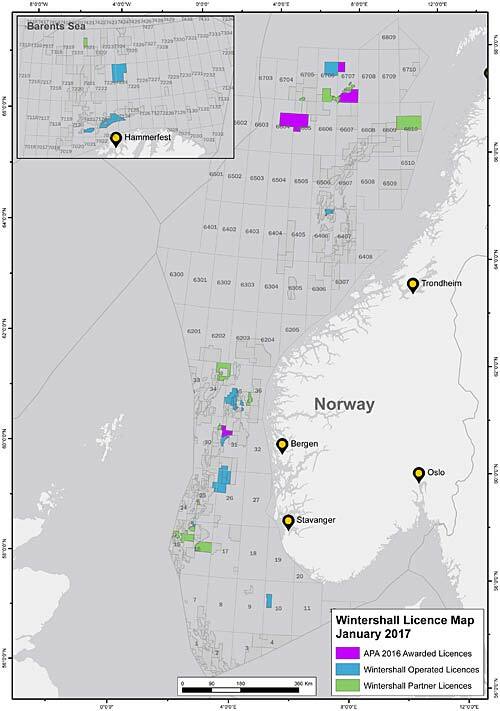 Two of the licenses are in the Norwegian North Sea and three are located near the Aasta Hansteen development in the Norwegian Sea (two operated). All of the licenses are in Wintershall core areas. “Once again the Norwegian Ministry of Petroleum and Energy has shown confidence in Wintershall by awarding us these promising licenses. Our goal is to maintain a long-term growth path in Norway so it is critical that we continue to expand our portfolio. We have a track record of turning our licenses into discoveries, particularly in our core areas and we have submitted strong applications with solid geological concepts,” says Bernd Schrimpf, Managing Director at Wintershall Norge. “This is a strong result for Wintershall. We have worked hard to identify blocks with a good chance of exploration success in areas where we have existing infrastructure and assets. This gives us the confidence to keep investing in our core areas, including the region around Aasta Hansteen, where we have an existing good cooperation with Statoil. Together we can contribute to extending the lifetime of the field,” says Guy Oakes, Head of Exploration at Wintershall Norge. The APA 2016 licensing round comprises blocks in predefined areas in the North Sea, the Norwegian Sea and the Barents Sea. It covers an overall surface area of 139,942 square kilometres and has been expanded with 24 blocks in the Norwegian Sea and 32 blocks in the Barents Sea since 2015. Some 33 companies applied for blocks.